Every society has its trash heap, and the former Supermax Prison Vossberg is no exception. Huddled against the walls in a vain hope for protection, Vosstown is nothing more than a collection of human garbage, scum, and outright filth. 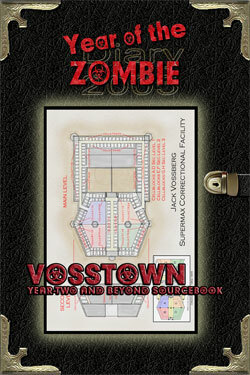 A temporary community at best, filled with those that the ex-cons of Vossberg considered too scummy to stay within their walls, Vosstown is a hopeless place where the strong prey on the weak, and the weak prey on the weaker. Most communities band together when faced with Mr. Hungry, but the residents of Vosstown just view the Rising as another way to screw their neighbors, or why they've been screwed out of their due in life. A Year of the Zombie adventure. Vosstown is rated M for Mature.